People generally want to say thanks when others do them a favor, it’s pretty common we shout someone a beer or a coffee, but it’s hard to do this online – assuming that person can even take an online payment in the first place, the typical method has always been to have to complete a credit card payment transaction, which is time consuming and frustrating. There are many times I’ve wanted to shout someone a coffee for a good blog post, a hilarious web comic, or some awesome open source application that I use every day. The concept isn’t exactly new,the real issue is getting a micropayment system that doesn’t take more than a couple clicks and which has enough of a critical mass of users and content producers to actually make it interesting to people. 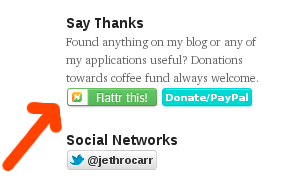 Lately I’ve been seeing more and more Flattr buttons around on sites I read and on the home pages for a number of open source projects I’m a fan of. Flattr has a clever solution to the micropayment problem by having a configurable monthly spend for your account – say €5. This amount is then equally divided across all the sites you’ve Flattr’d that month minus 10% that goes to Flattr themselves. This means you can just click away on things you love, without any unexpected bill shock and has a single monthly cost for all your content donations. To Flattr someone, you just need to click their button and depending on the button type, it’ll take you to Flattr to do a second click, or will just accept the first click. I also went and added a Donate/PayPal button for good measure – not that anyone ever *likes* having to use PayPal thanks to their horrible UX and their even more horrible business practices, but it is handy from time-to-time as it’s pretty universal and they tend not to leak credit card details around the place. It’s not a perfect solution, I think Flattr’s fees are too high compared to conventional payment providers which are more around 2.5-3%, but supporting micro payment solutions like Flattr could just help ad-free, paywall-free internet content to flourish. This entry was posted in Uncategorized and tagged coffee, donate, flattr, geek, micropayments, paypal. Bookmark the permalink. Making micro-payments easy and safe is a huge problem still waiting to be fully solved. We looked at this as a possible side project a couple of years ago. The technology is not the hard part. I won’t get into all the detail but the advice we received at the time (from an ex-CEO of a major bank) was “make sure you have a dedicated fraud management capability on tap 24/7”. That squashed our enthusiasm a bit, even given that we already have quite a bit of experience with online payments and fraud detection. I wonder who Flattr use as a payments intermediary? It’s quite hard to aggregate payments without a central clearinghouse of some sort, meaning you are forced to deal with a bank or perhaps utility provider (eg. for mobile payments) at some point. The intermediaries always front-load for risk and charge fees accordingly. The banks obviously don’t want to encourage any kind of disruptive payments system, so I can’t seem them adopting a less punitive charging regime any time soon. Core problem – find a way to remove the banks from the equation. Perhaps the ex bank CEO had a vested interest? With Flattr, it appears you pre-load your account with credit using a conventional credit card gateway and then set how much you want your monthly spend to be, so from a credit-card provider POV, it’s just a regular merchant. The sad thing about almost all new online payment systems is that they are usually reliant on credit card companies at the very end – and there’s only a handful of gatekeepers in the world who control online transactions – VISA, MasterCard and AMEX – as we saw quite clearly with the card processing companies being used to try and deny Wikileaks donations and funding.